When Kejriwal emerged after taking a dip in the holy Ganges, he told reporters that the country will face re-elections in 2015. According to him, “That is when our country will be free from the clutches of Adani and Ambani.” So in 2015, after re-elections, Adani, Advani and Ambani will all sink in the Ganges along with another person whose name also ends with an ‘I’. But if BJP wins in 2014, “Sir, yeh desh nahin bachega.” I am not saying this, Kejriwal is. Considering how hot he looks in that chequered towel, I believe him. Basically this means that we are in for uncertain times. No jobs. No growth. But why crib and be called a pessimist? So what if we are all in the gutter for now? We can always look at the stars. If we really focus on the bright side, there is a lot to cheer. Social service is in the air. Those like Paswan who believed that the man with an amazing voice modulation was Hitler, have suddenly realized that he is, in fact Mother Teresa. All in the name of social service. In the election season, everyone wants to give back to the society – KRK, Rakhee Sawant, Mahesh Manjrekar and Manoj Tiwari to name a few. Making people laugh is also social service, which is why Ms Sawant came dressed as a cucumber. Taking cue from the spirit of social service initiated by Rabri Devi, the wives of tainted politicians are ready to jump in the electoral fray.Some families have life long devotion to social service. Never Say Die Spirit abounds. In the entire election hullabaloo, we discovered our own James Bond – Amar Singh. No, his tryst with dusky long legs has nothing to do with my calling him James Bond. If you think this analogy is flawed, you should know that Sean Connery returned to playing the Secret Service Agent, in ‘Never Say Die’, after 12 years. Rising like a phoenix, our desi Bond (no physical comparisons please, can’t you look beyond the ephemeral?) joined Rashtriya Lok Dal, along with his Prada carrying Bond girl, Jaya. And like other secret agents, we don’t know what or who Amar Singh stands for. Out on bail for cash-for-vote scam, Amar finally found his calling in the company of Ajit Singh. Ek Amar, to doosra Ajit – invincible. Which means maximum bargaining power at the time of ‘stallion trading’. And those who thought Amar was done and dusted after he fainted at a Dubai airport can go watch ‘Die Another Day’. More good news. Several family dramas are playing in your nearest theatre. One is playing in Tamil Nadu where son Alagiri was expelled by his shady daddy, I mean daddy in shades. There is Sadhu Yadav (such an apt name, I tell you) contesting against his own sister, Rabri. The once loving sister is now calling estranged Sadhu bhaiyya 'Dushman'. 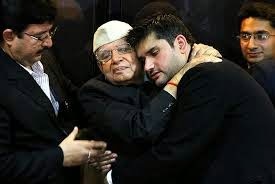 Another riveting spectacle is being played in Nainital, where N D Tiwari accepted his son after a long legal battle and a DNA test. Taking a cue from Kejriwal’s style of asking the public, Tiwari wants the people to decide whether his son should contest from his political seat. Indeed, a positive development for participative democracy! This election season is all about glamor and entertainment. So what if Pawan Bansal, the clean candidate from Chandigarh, gets your goat? Believe me, he knows a lot about goats. But forget goats, residents of Chandigarh are enjoying the battle of dimples between Gul Panag (Bullet Rani - she rides a Bullet) and Kirron Kher (muse for all Surajmal Pannalal Jewelers - can carry loads of precious stones). Let’s come back to AAP and health benefits. With Kejriwal in the picture, I don’t need my daily dose of Sudoku. By the time I am able to make up my mind about AAP, Kejriwal goes ahead and does something which makes me re-think. All in all, no one is missing the IPL entertainment. After Salman and Ranbir, who would have imagined that the humble towel will find a new muse in Kejriwal. Like the current 'hope rally' on the sensex, I am optimistic. I hope you are not referring to AK Hangal or AK Antony. That can be quite scary. Hmmm...no. All brawn, no brain. Loads of drama happening on the political scene. I wonder what the next 5 years will bring. Err..noooo... 'hint of sarcasm', maybe'. There is more. Rakhee Sawant is in the fray. "And like other secret agents, we don’t know what or who Amar Singh stands for." - :D Alka, superbly heartless and so delightfully, you summed up the election season for us all, and how! Liked the choppy sentences, which added to the hammer-on-the-nails effect. Enjoyed it, as usual! When one is competing with Ms Sawant who joined the bandwagon, such item numbers are inevitable. That was such an apt portrayal of the political scene in India :) So all it takes is a towel eh? ;-) and loved the "Prada Girl" and "Shaddy Daddy" jibes... hilarious! You have a way with political satire Alka! Glad you liked it Seeta. Thank you. You play Sudoku? Oh, God! No wonder your posts pack such amazing punches. Thank you for bringing The Circus to my laptop, 100% free! Mumbai is witnessing the best with KRK, Rakhee and Manjerekar in the fray. areee who needs Saas bahu serial now. Indian politics is all about 'ENTERTAINMENT ENTERTAINMENT AUR ENTERTAINMENT'. Even as I write, Rakhee joins the bandwagon. Satire is one way to look at the circus around.The other is to join the bandwagon. What if Kejriwal's Tawaliya act was just another move to reaffirm how much he believes in transparency! I mean only a great leader like our AK-47 can expose himself so embarrassingly while claiming to expose others. Heehee to the first sentence. Me thinks the edge of his tattered hanky saved his modesty. Wonder if AK Hangal is feeling left out! You are right, Alka. Politicians do play to the gallery. Sporting different hats, coo-ing at babies and taking dips in the Ganges amidst much publicity are all harmless enough. Some of the candidates you describe sound positively dicey. It is like they are fighting to sink their claws into a prize, irrespective of their qualifications. Hope your local candidates are worthy of your attention, leave alone your votes. So glad India Today (and folks on Twitter, I'm told) made a noise about candidates with 45 cases pending against them getting seats. Fortunately, I have a good candidate in Yogendra Yadav.. I hope he will stay in Gurgaon and solve our problems unlike AK 49. Wow. Thaw was a superb commentary on Indian politics. Uff all the election shenanigans are leaving me completely breathless ;-). Good, hard hitting post! Will we ever see an end to this dramebaazi? Hopefully it ends in April, unless it is a semi final according to AK 49.
:) when he knew that a battery of photographers were around, he should have been more careful. Boxers maybe! Oh, this was replete with such gems! Prada carrying Bond girl, Shady Daddy, 20 kg gold carrying capacity, ek Amar toh doosra Ajit! Totally loved it. The elections in India is like ghar baithe wholesome entertainment that even Sajid Khan can't top! Oftentimes such posts can come across as total Siyapa. But glad you enjoyed this. Yes, real time entertainment is on for a month. Unless this is a semi final as Kejriwal calls it. According to him the finals will be played 2015. Scary. So is towel the game changer for you? :) Have you read Bacchi Karkaria's columns in TOI. The ethos of your posts and her columns are same. Kudos. Bachi is up there. I am learning to write while having fun with words. AB AYEGA ASLI MAZZA said Gabbar Singh. You as usual have said everything without offending even AK49. They know that they will not come to power in 2014 so their best option is to create chaos in the semi finals and win the final in 2015. We need a stable govt for the next five years. I had this post open in another window for a day now and just now I got the time to read! And what fun way to end a hectic day! 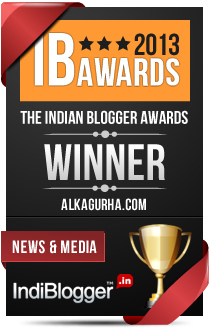 My first read here at your blog, Alka and I am so glad I dropped by. You write what I want to read. Kudos! So good to see you here Naina. And so glad you liked it. Thanks, your presence here means a lot. Rakhi is pitted against Kamal Rashid Khan! Both want to give back to the society. Glad you enjoyed this.Thank you. Seriously, there is no scarcity of drama in this country. Truly wholesome entertainment. AK definitely has made a lot of promises but I doubt if he'll survive to honor them or he'll also join the bandwagon by choice or by force. One step at a time was perhaps the way to go but they decided to jump. What a charade this has become, Alka! You've captured it so well! Delighted to see you here. I was thinking about you yesterday. Thanks for stopping by Prudhvi. Elections give me a feel of the Masala movies of Bollywood. I hope we don't come out of them pulling our hair. Yay...thank you. Means a lot. Thank you Diwakar. I try Sudoku to jog my brain cells! Yep, total entertainment. Hope some good comes out of it. A hilarious round-up --and all so true.Aren't elections supposed to be serious business?Looking at the shenanigans of the contestants one would never have guessed.